Are you on the hunt… for the perfect souvenir to bring home? One of the many things I like to do while “home” at Disney is to bring something back to stir a memory of my trip. I started this tradition a few years ago, and now have quite a few neat things that make me smile. 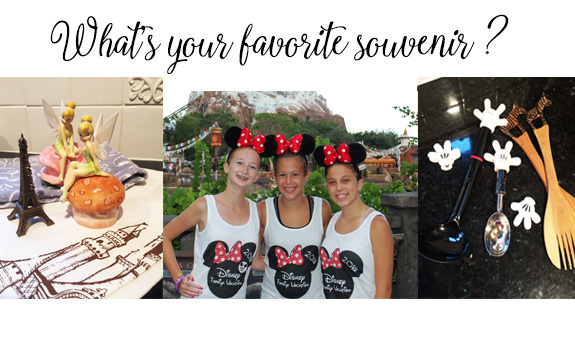 From a soup ladle that I purchased in Hollywood studios to a well-loved Disney Cruise line sweatshirt, I have lots of wonderful items. Sadly, some of these items can be pretty pricey as well, so I usually browse the first few days to see what is worthy and within my budget to bring home. That’s the thing about Disney, generally there are trinkets for every budget. One year while staying at the beautiful Animal Kingdom Lodge, I purchased some carved salad tongs. Another year was a soup ladle from Hollywood Studios. I brought the ladle to a chili contest once, and all my co-workers knew immediately which ladle was mine. When I won the chili contest, one of them took paper and made an obscene gesture with the fingers. Naughty! But yet another fond memory made with a souvenir from my trip. One of my favorite souvenirs was a sweatshirt I bought on a cruise. I debated over whether to purchase it, and I am thankful that I did as I have had over 12 years now. It’s getting worn now, so I may have to take another cruise to replace it… I also have a well-worn ice cream scoop which I can’t bring myself to throw away. They have also started a wonderful line of salt and pepper shakers, from which I have a few sets from too! For some reason, I have a lot of kitchen items, perhaps to make everyday tasks a bit more fun. Then there are the necessities. Like mouse ears. I am sure most of you have these, they are so plentiful at the park. It’s funny how we will wear them everywhere while “home”. I just love how creative they have gotten with these! On our last trip, we lost a pair, and could get them at the lost and found the next day. If you ever lose anything, check the lost and found at the park you lost the item. The next day all items are brought to the office at the Transportation Center near the Polynesian. They are incredibly organized, and quick to help. If you happen to forget to purchase your souvenir, or decide you cannot live without something, Disney’s guest relations are wonderful and will usually be able to find, and ship you the item you forgot. Trust me, I have used this service in the past. If you are still at the parks, they now also have a shopping app, which you can search for items, and it tells you where to find them on property. Something that is also very handy, and amusing when you are waiting in a line. Disney does a great job having something for everyone! So now you have heard my obsessions, what can’t you resist?